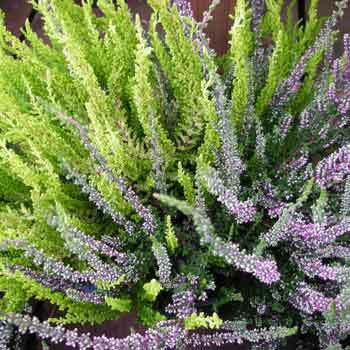 Heather is an evergreen shrub; the prostrate, grayish, hairy stem grows up to 3 feet long and sends up branches 1 to 1 1/2 feet high. The dull green, sometimes gray, small, linear-lanceolate leaves grow in 2 overlapping rows. Branching spikes of light violet, bell-shaped flowers appear in August and September. Rare in the United States but commonly found on poor soils and marshy grounds in Great Britain and Europe. Flourish on heaths and moorlands; where the soil is moist and peaty. Used for insomnia, depression, gout, rheumatism, stomachache, coughs, and facial skin problems. Heather contains compounds that act to constrict blood vessels, strengthen the heart, and moderately raise blood pressure; also, stimulates the flow of bile and of urine. Infusion: for insomnia; steep 1 tsp. shoots in 1/2 cup water. Sweeten with 1 tsp. honey. Decoction: boil 4 tsp. shoots in 1 cup water for a short time only. Take 1/2 cup per day.